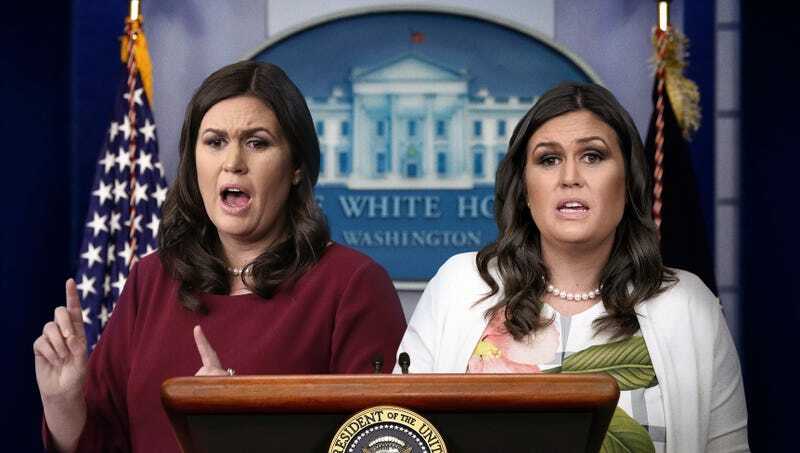 WASHINGTON—Completely mystified by the sudden appearance of two press secretaries attempting to undercut each other’s statements to reporters, a bewildered White House press corps sat in shock Tuesday watching dueling Sarah Huckabee Sanderses each claim that the other one was lying and she was the only one telling them the truth. “Jesus Christ, they’re both standing up there trying to wrest control of the podium, and each of them keeps insisting that she’s the real, truthful Sarah Huckabee Sanders and the other one’s a dishonest imposter,” said visibly overwhelmed New York Times reporter Maggie Haberman, adding that White House correspondents were struggling to take notes as each press secretary repeatedly interrupted the other by declaring that everything she uttered was false. “Someone was confronting the press secretary about the truthfulness of her response to a question, and then all of a sudden there were two of her, each shrieking that the other one was trying to mislead the nation and undermine her credibility. People here are really starting to freak out; I saw [CNN reporter] Jim Acosta dash out of the room—it looked like he’d been driven mad. After someone asked about the president’s reaction to the Mueller probe and both of them just pointed to each other and said ‘Do not be tempted by her lies,’ I don’t know what to think.” At press time, the confused White House reporters decided to just print everything said in the room by both Sarah Huckabee Sanderses without clarification or comment.